New Delhi: Initiating a strong dialogue, PawanMunjal, called on the Private sector to partner the Government agencies in channeling resources to nurture and grow the game of golf in India. The Chairman, Managing Director and Chief Executive Officer of Hero MotoCorp, the world’s largest two-wheeler company and the biggest corporate supporter of golf in India, expressed his views on the sidelines of India’s marquee golf tournament – The Hero Indian Open – in Gurugram today. 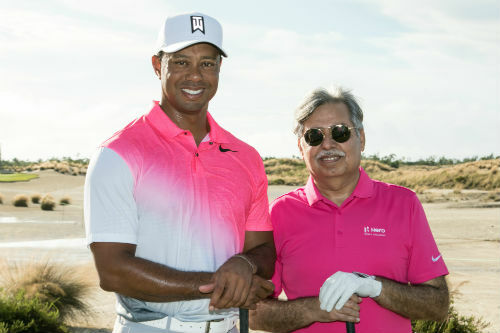 As the past Chairman of the Asian PGA Tour Board of Directors and the Past President of Professional Golfers Association of India (PGAI), PawanMunjal highlighted the need for better golf infrastructure and facilities in the country. He feels that more support from corporates will help in nurturing young talent and taking India’s international profile in the sport to the next level. PawanMunjalalso proposed to introduce the sport to kids at early stage to create interest and passion for the game. “An initiative that can really push golf to the next level would be to include it in the physical education curriculum in schools and even colleges like it happens in the United States.”, he said. The Hero Indian Open, the European and the Asian Tour co-sanctioned tournament is currently underway at the DLF Golf & Country Club in Gurugram, Haryana. The 54th edition of the Tournament has laid out the strongest-ever field where India’s golfing champions, including, SSP Chawrasia, AnirbanLahiri and Shubhankar Sharma are competing with some of the world’s highly popular golfers – Emiliano Grillo of Argentina, UK’s Andrew Johnston and Denmark’s Thomas Bjorn.